Originally published under the title "Erdogan's Goon Squad Comes to Washington." According to the official narrative, U.S. President Donald Trump was hosting in Washington the leader of a long-friendly country and historic ally. In typical diplomatic niceties, Trump mentioned Turkey's role as a pillar in the Cold War against Soviet expansion, and Turkey's legendary courage in fighting alongside American soldiers in the Korean War in the 1950s. Trump also said, speaking of the present, that he looks forward to "working together with President [Recep Tayyip] Erdogan on achieving peace and security in the Middle East, on confronting the shared threats, and on working toward a future of dignity and safety for all of our people." Facts on the ground, however, are frequently less pleasant than Kodak-moment niceties. The fundamental incompatibility between Trump and Erdogan was too apparent from the beginning of what looks like a largely transactional, pragmatic but problematic relationship. Erdogan's political ideology is deep-rooted in an often-aggressive blend of Sunni Islamist supremacy and neo-Ottoman, Turkish nationalism. Erdogan, disregarding Saudi Arabia and other possible contenders for the title, claims to be the protector of Sunni Muslims across the Middle East, and does not hide his ideological kinship with groups such as the Muslim Brotherhood and Hamas, of which Trump is not a great admirer. Erdogan espouses a blend of Sunni Islamist supremacy and neo-Ottoman Turkish nationalism. In contrast, Trump hit out at Muslims during his campaign and proposed both a "Muslim travel ban" and a "Muslim registry." It was only too predictable: in response, Erdogan, in June 2016, called for Trump's name to be stripped from the Trump Towers in Istanbul. 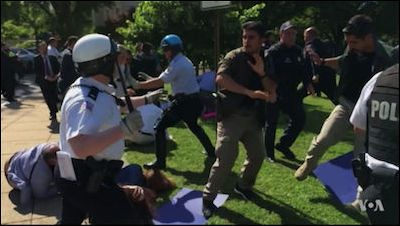 Erdogan's Washington, DC visit, apart from Trump and Erdogan agreeing to disagree on more essential issues, will be remembered as a Turkish excess, with scenes of the bloodied faces of peaceful protestors beaten up by Erdogan's bodyguards in front of the Turkish ambassador's residence. Although these unpleasant incidents caused an uproar in America, such brutality should have come as no surprise. Slightly over a year ago, Erdogan and his team were in America on another visit, with the Turkish president scheduled to speak at the Brookings Institution. His security guards harassed and physically assaulted journalists trying to cover the event; they also forcibly attempted to remove several journalists, although they were on the guest list. According to Reporters Without Borders (RSF), the Brookings staff prevented them from ejecting the reporters. One Turkish journalist was removed from the building while checking in. 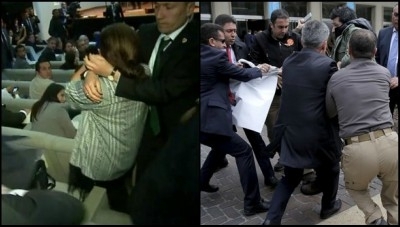 Erdogan's bodyguards roughed up protestors last year in Ecuador (left) and during a previous trip to Washington, DC (right). But that was not the entire show. An American reporter attempting to film the harassment was kicked in the chest. The National Press Club was outraged. "We have increasingly seen disrespect for basic human rights and press freedom in Turkey," said the president of the Club, Thomas Burr. "Erdogan doesn't get to export such abuse." Shortly before that, in February 2016, Erdogan had embarked on a Latin America trip. During his speech at the Instituto de Altos Estudios Nacionales (National Higher Studies Institute) in Ecuador's capital, Quito, a group of women began shouting "Fuera Ecuador Erdogan" ("Get out of Ecuador, Erdogan") and "Asesino" ("Murderer"). About a minute later, Erdogan's bodyguards brutally attacked and forcefully removed them from the room: they punched the protesters in their heads and breasts. As the women were removed from the room, Erdogan said: "As we see now, there are sometimes disrespectful characters as well. Appropriate responses will always be taken to handle these disrespectful people." Erdogan appeared to have given his bodyguards direct instructions before they assaulted protestors on May 16. 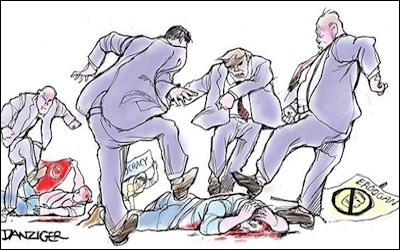 The embassy violence, however, and the savagery of Erdogan's Turkish enforcers, whom many observers in Washington viewed as thugs, reflects a new dimension in carrying his message to any potential leader who may host him. CNN's Marc Randazza, after mentioning video footage showing Erdogan speaking to the black-suited agents before they rushed the protesters, said, "It was brutal -- with the agents punching protesters and kicking them while they were on the ground.... The word outrage," he wrote, "does not come close to describing this incident." The bloody clash sent nine people to the hospital. The White House remained silent, but the Turkish ambassador was summoned to the State Department, which "raised its concerns about these events..." Secretary of State Rex Tillerson said the administration's "dismay" had been expressed to the Turkish government. We should throw their ambassador the hell out... This is the United States of America. This isn't Turkey; this isn't a third-world country; and this kind of thing cannot go unresponded to diplomatically. Instead, the Turks added insult to injury. The Turkish Foreign Ministry on May 22 summoned U.S. Ambassador to Turkey John Bass over the incident to give him a verbal and written protest. But what could Turkey be protesting after its president's bodyguards attacked a defenseless, small bunch of peaceful protesters? Read the Turkish ministry's statement about the protest: "... due to the aggressive and unproffessional [sic] actions taken, contrary to diplomatic rules and practices, by US security personnel towards the close protection team..." Turkey probably was protesting the United States not giving President Erdogan's men a license to kill. The second "Turkish circus" in Washington in a span of about a year must have demonstrated to the free world the kind of oppression that any kind of dissent may earn protesters in Turkey. There is one difference, though. The peaceful protesters in Washington, mostly Kurds, were merely beaten up by Erdogan's bodyguards. Similar protests in Turkey usually end up with brutal police beatings -- followed by arrest and prosecution, often on charges of "terrorism."